Wyoming Nonprofit Network member, 1st person from organization is $45.00 per person. Each additional person from same organizations is $25.00 per person. First person from organization is $60.00 person; each additional person from same organization is $40.00 per person. Members: If you have already registered and need to register additional board members or staff, use this. Not-Yet-Members: If you have already registered and need to register additional board members or staff, use this. 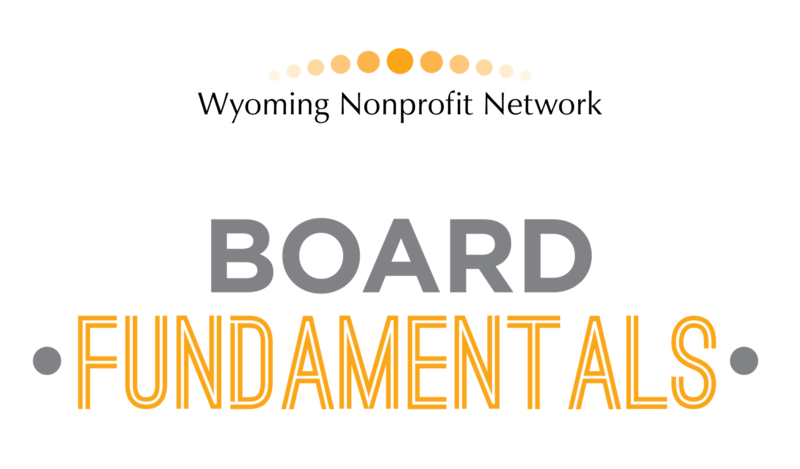 Registration fee includes lunch and a Board Fundamentals Notebook. Presenter: Jody Shields, Executive Director for the Wyoming Nonprofit Network, and Vice President for Align. Jody has over 25 years of experience in the nonprofit field in a variety of capacities, including consultant, trainer, board member, executive director and in other staff positions. Jody has a bachelor’s degree from Arizona State University, a Master’s Degree in Strategic Leadership from Black Hills State University and a Certificate of Nonprofit Board Consulting from BoardSource.